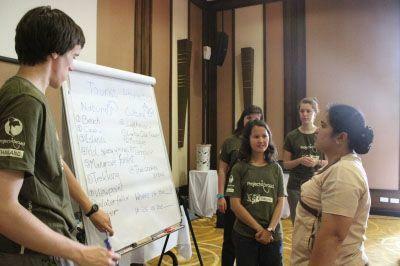 Projects Abroad’s Teaching volunteers in Thailand have been busy helping local adults improve their spoken English. They have just finished running a week-long intensive course in conjunction with the Labor Skill Development Center of Krabi Province. British volunteers Fiona Taylor, Jakob Op den Brouw and Natalie Chatwin, and Danish volunteer Astrid Trier Gronfeldt ran the course during the Thai school vacations. 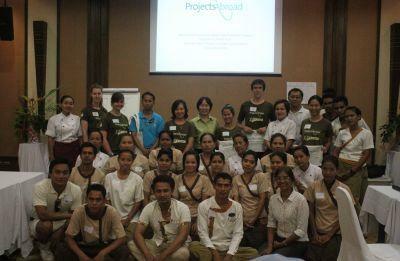 Instead of teaching children, the students were adults working in hotels on Koh Lanta Island. The 30 students included cleaning staff, maids, chefs, waiters and waitresses and gardeners. The volunteers’ hard work really paid off as the students were eager to learn and participate in the activities. The Teaching volunteers received highly positive feedback and the improvement in the students’ level of English was tangible. Tourism is the main source of employment in Koh Lanta and being able to speak English is crucial for the locals wanting to work in the industry. Our volunteers’ help on this project was invaluable. Being able to speak English improves the students’ job prospects, directly benefitting both them and their families. Projects Abroad were invited to run this course by the Labor Skill Development Centre of Krabi Province after a similar successful project last year. The request was received at short notice and the four volunteers did an exceptional job at organizing classes and preparing worksheets and materials. At the closing ceremony on the last day, eight students spoke about their feelings and what they had learnt on the course. One student got very tearful and could not express themselves as the experience had been so overwhelming for them. For the volunteers themselves the project proved fun and worthwhile and it probably helped that after a long day teaching, they could relax and unwind on Koh Lanta’s beautiful beaches.